STATESVILLE, N.C. -- Two-time N.C. State All-American Justin Walters of Raleigh shot 67 Thursday to take home the $9,000 first-place check in the Tarheel Tour's Statesville Open. Walters finished at 17-under 199 for his 11th professional win and his first on the Tarheel Tour. Although he managed a four-stroke margin of victory, it did not come easily. Walters played the first round with an old set of clubs after an airline lost his new Taylor Made set. And, that same airline didn't get him into Raleigh until the early hours of Tuesday morning, the same day he had to tee off in the first round at Statesville Country Club having never seen the course. But after shooting three rounds in the 60s and getting his clubs back for the last two rounds, all was well. "Not having my clubs forced me to reunite with my old putter and it worked for me all week," the South Africa native said. "I only made two bogeys all week, and none in the last 30 holes. I stroked it great and putted great." Walters had all the answers for the subtle breaks on the greens that affected most of his competition. The only thing that stumped him was why he didn't go back to his old putter sooner. "It felt really good in my hands all week," he said. "I thought, 'why didn't I do this before?' 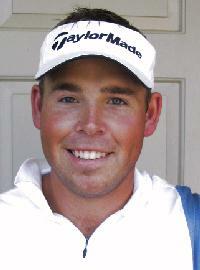 "
A former N.C. State teammate of Walters made a major charge up the leaderboard in the final round. David Sanchez of Pinehurst tied the course record with a 62 to jump from 23rd to second at 13-under 203. Sanchez rolled in six straight birdies starting at the 10th hole and also had an eagle en route to earning the $5,000 runner-up check. Former Wofford golfer Derek Watson of Murrells Inlet, S.C., closed with a 70 to finish third at 204 and take home $3,000, while Charlotte's Ben Case (Pfeiffer) and Laurinburg's Frank Adams III (East Carolina) tied for fourth at 205 and collected $2,250 apiece. David Seawell of Columbia, S.C., Fernando Mechereffe of Charlotte, Will McGirt of Taylors, S.C., and Greensboro's Ryan Gioffre tied for sixth at 206 to win $1,406.25 each. Seawell, who played the PGA Tour in 1999, posted the day's second best round, a 65. The Tarheel Tour returns to action next week with the Raintree Invitational at Raintree Country Club in Charlotte. Play begins Tuesday.